As a parent, you are the foremost teacher for your children, and teaching them how to make smart choices about money is one of the most valuable lessons you can impart. While it may seem daunting, it is possible to put your kids on the path to being financially fit by setting the right example and making a consistent effort. This process is best viewed as a multiyear effort: Your kids will mature through several stages, each offering opportunities where you can have a significant impact. The important thing to remember is it’s never too late to offer your own guidance and experience. As you consider where to start, it helps to think about your overall goal: Teaching your children the life skills they will need to become financially fit adults. What core lessons are you trying to teach? What will success look like to you? While some parents may want their kids to achieve great wealth, others may simply want their children to do as well or better financially than they have done. One goal may be to simply arm your kids with the skills they’ll need to achieve financial freedom. A step beyond that may mean teaching kids to have sufficient savings and limited debt so they’re able to pursue the careers and dreams of their choice. In others words, help them build enough wealth so money doesn’t control them, but have them still understand the value of hard work. It’s never too early to start teaching kids about money. In fact, it’s best to start the conversation before your children are teenagers on the brink of making important financial choices of their own. Money lessons start by you setting a good example. Practice what you preach and keep your own financial house in order. 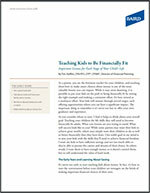 Kids know when parents are having financial struggles. If they see you running up credit card bills or being wasteful with cash, they will think it’s okay to do the same. Likewise, if you’ve faced and risen above these challenges, you shouldn’t be afraid to share your own mistakes and what you did to correct them. It is also important to discuss early on where money comes from – for most of us, money is earned for the work we do. Taking your kids to your place of employment, discussing what you do to earn money, and sharing your own savings and budgeting practices are integral to helping your kids learn about money. You don’t have to disclose the details, but you should aim to give them a general overview of how your family’s finances work. For many kids, their first introduction to money will be cash or checks given to them on a birthday or through an allowance. Talk to them about how they can use the money they receive – they can spend it, they can save it, or they can give it to church or a charity. If you want to teach the rewards of saving or giving, consider a matching program – offer to match whatever they put away in a savings account or give to a charity. Matching allows you to reward positive behaviors you think are important. As we’ll discuss later, offering a match could also be continued into the teen and early adult years, when it can have an even bigger impact. Young children with small sums may just be putting money in a drawer. Some parents take the extra step of setting up a simple spreadsheet to track money in and money out, or adding a match or meaningful interest rate to demonstrate the value of compound interest. With slightly older children, you can open a savings account. Try to make this fun. Some financial organizations allow kids to purchase a share of stock or buy a mutual fund with specific holdings of interest to children. This can be a good way to give kids a taste of investing. There are different philosophies on allowances. Some parents tie it to some tangible work, while others simply give a flat amount based on the age of the child. Still others will pay as an incentive to reward certain desired behaviors – say reading or practicing a musical instrument. The most important element of the allowance is helping kids make good choices about how they use the money by rewarding important financial skills, such as saving. That said, making a child save everything and miss out on the enjoyment that comes from spending money can do more harm than good. Being too frugal with money can lead to just as many issues with future financial decision-making as being too reckless. As children mature and become teenagers, they may have the opportunity to work and earn their own money. There are many different approaches to teens and work. Some families require that kids work as soon as they are able. Others encourage their teens to work in the summer, when school activities or sports aren’t as likely to conflict. Even kids with busy schedules can sometimes pick up babysitting or tutoring gigs, or find jobs that will schedule around their activities. Work of any kind can be valuable in teaching teenagers about money. And don’t discount those less-glamorous first jobs, such as working in a fast food restaurant. It can teach some powerful lessons – and reaffirm the value of an education. This first paycheck is also an important time to introduce a “pay yourself first” mentality, before they have real obligations for rent or car payments. A simple rule is to always save 10% of every check. Explain that later on, if they don’t subtract the savings first, money will easily get allocated to paying bills – or be spent on lattes and burritos. Again, offering a match to any money saved or put into a college account can be very effective at reinforcing this important behavior. With ever-increasing costs, many parents require their teens to save early for college. Be reasonable with the types of savings goals you enforce on a 16-year-old. It can be counterproductive to require them to save all or a majority of their check. You want to reinforce good work habits by allowing them to experience the rewards of their labor. Beyond what you can teach them at home, some high schools offer personal finance courses. Encourage your kids to try these classes, as exposure to these principles at school can reinforce what you are teaching at home. Finally, as teenagers begin to accumulate some savings, take advantage of the opportunity to introduce basic investing concepts and even allow them to buy shares of a stock or mutual fund. This can potentially spark their interest in money and importantly, how to make it work for them. The college years offer many opportunities to discuss choices that can have a long-term effect on a student’s future financial well-being. College is a time when kids are often living independently for the first time. Establishing a budget and helping them stick to it are critical, and keeping spending money separate from savings can be a good first step. Teaching them how to avoid identify theft is also important. Encourage them to keep financial information such as their Social Security and account numbers secure. Tell them not to leave account statements or personal information in dorm rooms or in backpacks that can be stolen. Just because kids don’t have a lot of money themselves doesn’t mean an identity thief can’t cause long-lasting financial harm. It is at this point when many young adults are first exposed to debt. College loans are a fact of life for many students, but just taking out a loan without thinking carefully about it can put many kids in the financial penalty box before they’ve even really begun their careers. We encourage parents to talk to their kids early about what they are willing to pay for (both for undergraduate and graduate school) and what the student’s responsibility will be. Discuss the choices students might need to make, such as working during the school year or living at home for a year to help defray costs. Be sure to also talk about the implications of student loan debt – both the monthly payments and the number of years it will take to pay the debt off. We encourage parents to sit down with their older kids entering student loan contracts to help them gain a realistic understanding of the implications. It’s worthwhile to use a college cost calculator or create a simple spreadsheet to enter in various costs, debt levels, projected income and payments. This can lead to some challenging conversations about college choices. If your child’s dream is to pursue a field in service or education, where salaries over time are more modest, taking on significant debt to attend a high-priced private school may not be realistic. Help them consider alternative schools that may still prepare them well to realize their dreams while resulting in a more reasonable debt load. Many entry-level jobs pay the same regardless of where your degree is from – or what you paid to earn it. Students may also apply for and get their first credit card during the college years. Credit cards aren’t inherently bad, and having a credit card and paying it off monthly can contribute to building a credit record. However, students can undermine their credit with late payments or by piling on debt they cannot pay. Fortunately, there are a number of ways for parents to reduce the risks, such as putting limits on the amount of credit or setting up automatic payments from the child. Most importantly, parents should always monitor the account and shut it down if it isn’t being managed properly. Most parents continue to play a critical role in guiding their children even after they graduate from college and are out of the family home. When they land their first jobs, many young people will qualify for car loans or other revolving debt. Now is an important time for them to build their credit record. Encourage them to set up automatic payments to avoid late charges. Talk to them about their credit score and the impact it can have on their future costs of borrowing. Show them the impact of defaulting on debt. Some parents will incent young adults to fund their retirement accounts by continuing to pay some expenses, such as car insurance or cell phone bills. If your child’s employer offers a match, encourage them to at least save enough to get the full match. 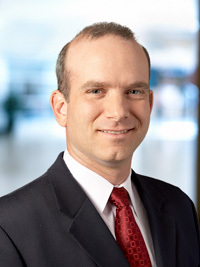 If they are not eligible for a retirement plan, help them set up an IRA or a Roth IRA. Again, offering to match their savings can be powerful. Saving early and often is important thanks to the power of compounding. Putting just $50 in an account on a monthly basis can be a positive experience as they see the value grow. Consider the chart to the below. 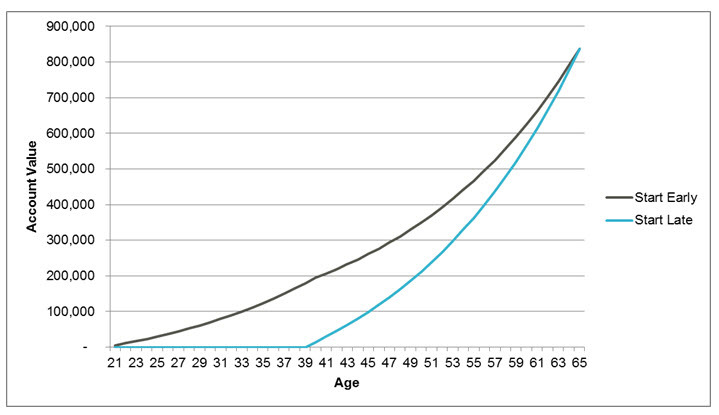 In this example, a 21-year-old saves $5,000 per year for 20 years and then stops at age 40. If a 40-year old were to start a savings plan, he or she would need to save $13,344 per year for 26 years to have the same ending dollar value at retirement, assuming 6% growth in both cases. Saving just $5,000 per year, and doing so only from age 21 to 40, will provide over $836,000 by age 65, assuming a 6% investment return. This is a hypothetical example for illustrative purposes only. Discussing how to budget for fixed and variable costs can be helpful. A simple budget that itemizes their fixed costs every month – rent, utilities, food, gas, car payment, taxes – can help them understand how much extra money they will have for entertainment or other nonessentials. Many young people earning their first paycheck may feel like they have a lot of extra cash. However, with very little effort, that extra cash disappears quickly when they go out every weekend and buy a few rounds of drinks for their friends. Treating entertainment as a budget item is one solution. Encourage them to decide how much they are willing to spend each month, and put that money in an envelope. Pay cash only and avoid using credit cards. When the money is gone, it’s gone. This is an important time for independence while the stakes are still relatively low. 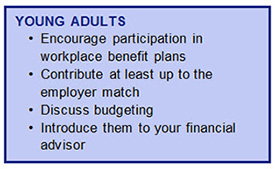 Young adults need and want to make their own decisions. But, a little guidance can go a long way. It can be helpful to have them talk to your financial advisor who can make a few recommendations based on their stage of life.